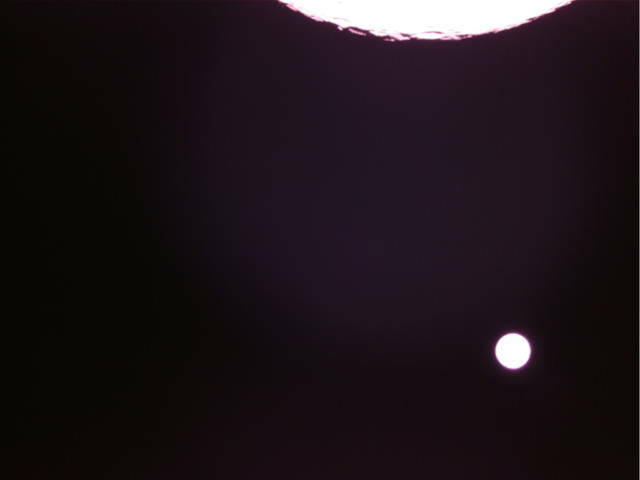 On 2018-10-06 13:55 UTC, when a part of the Moon was expected to be in the field of view of the camera, an image was taken to be downloaded later. The image was downloaded the next day at 10:20 UTC (note that it takes roughly 10 minutes to download an image, so this time refers to the beginning of the transmission). Reinhard Kuehn DKL5A commanded the download using the 2m Amateur satellite band and the transmission was received by the 25m radiotelescope at Dwingeloo. The image is very over-exposed. An analysis of the image showed a camera pointing error of 3 degrees in comparison with the predictions. This error is small and tolerable. The small gap in the middle of the image was caused by a frequency jump in the transmitter. This can be seen clearly in the waterfall of the signal. 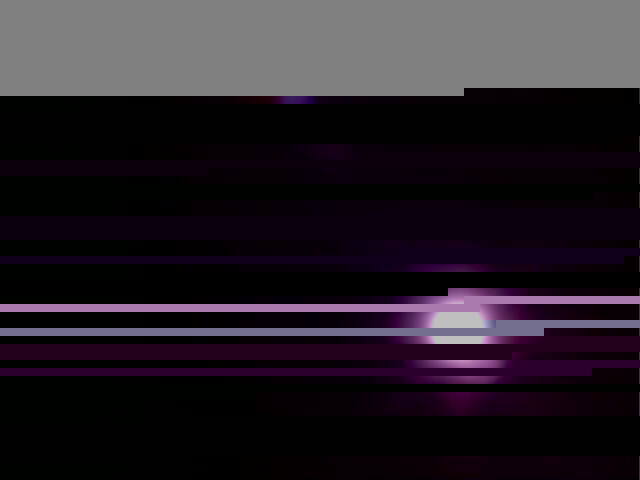 The beginning of the image is missing because the first chunk of the SSDV data was not transmitted due to an unknown software problem. The end of the image is also missing, as the transmission was cut short. 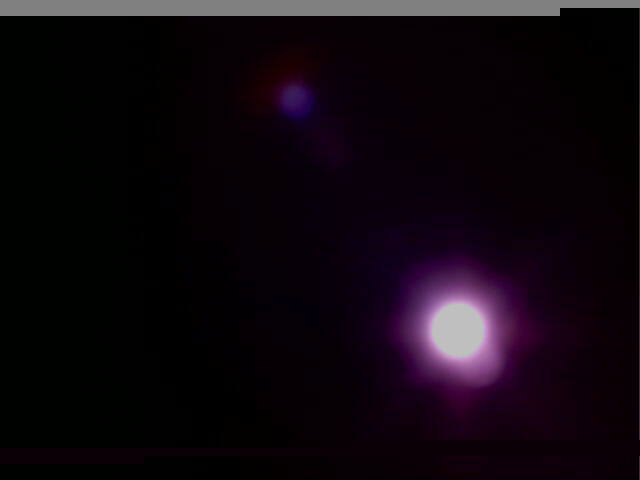 After receiving this image, Reinhard sent commands prepared by Wei Mingchuan BG2BHC to correct the exposure of the camera and take another image to validate the exposure. 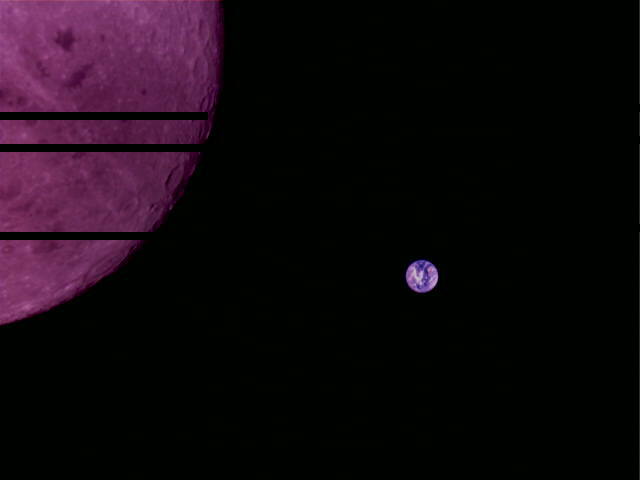 The image was taken at 11:10 UTC and transmitted at 11:20 UTC. Analysis of this image shows a pointing error of 1.8 degrees. 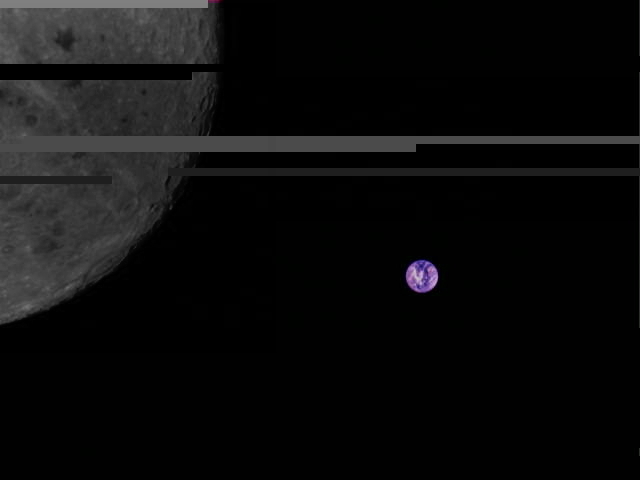 As in the previous image, the first SSDV chunk was not transmitted, so the beginning of the image is missing. The two images shown above have been decoded by myself using the recordings of the radio signal done at Dwingeloo. Thus, they can differ slightly from other versions of the image that you can find on Twitter or in the DSLWP-B camera webpage. If you click on the images, you will get a JPEG file that has been directly decoded from the SSDV data transmitted by the satellite (so ignoring missing chunks, it contains the same JPEG data as the image onboard the satellite). There has been no editing of the image. The rest of the images shown in this post have been obtained either from the DSLWP-B camera webpage or Twitter, since the recordings for these images have not been published. The next day, on October 8, the UHF radio in DSLWP-B was scheduled to come on at 08:21 UTC. During this 2 hour activation, an image capture and download was commanded by Reinhard, received by the radiotelescope in Dwingeloo and published in Twitter by Cees Bassa. 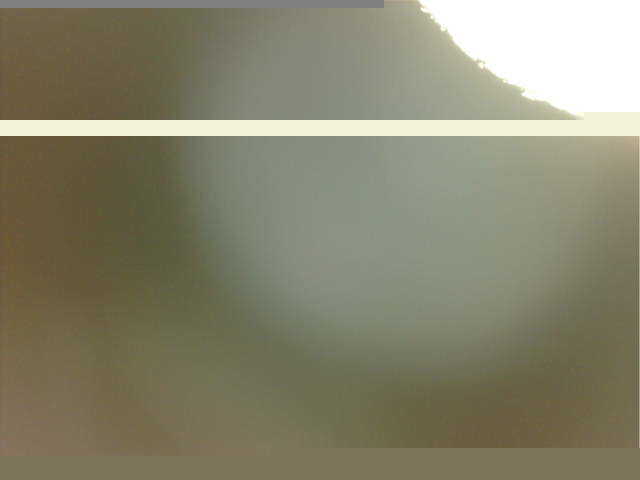 Unfortunately, the recordings of the radio signal for this download have not been published, so the image shown below is taken from the DSLWP-B camera webpage. I do not have an exact confirmation for the time when the image was taken, but I expect it to be around 08:21 UTC, when the UHF transmitter was activated and the Moon was nearest to the centre of the camera. After seeing that the image was still a bit over-exposed, another image with lower exposition was made and downloaded. 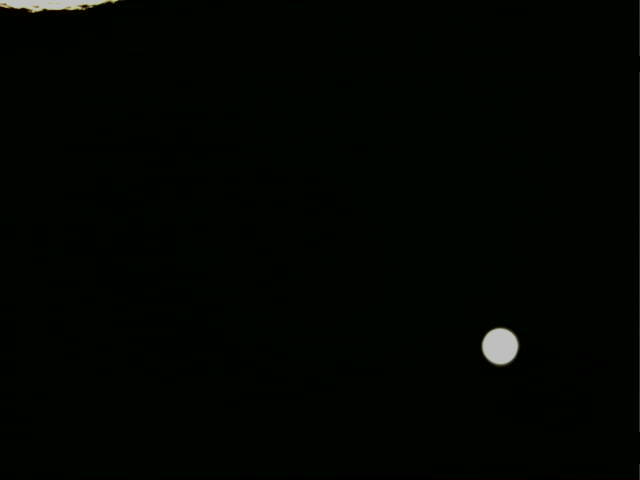 This image is still over-exposed, since the automatic exposure algorithm of the camera needs a larger part of the Moon in the image to correct the exposure. I do not have the exact time when this image was made, but given the fact that the Moon is still in view (it would quickly disappear as DSLWP-B continued its orbit) and the timeline of taking and transmitting the previous image, I expect that the image was taken around 08:45 UTC. The image was published on Twitter by Cees at 09:52 UTC. Also, the first chunk of the image taken on 2018-10-07 at 11:10 UTC was downloaded during this activation, completing that image. Update 16:15 UTC: Cees Bassa has now published the rest of the recordings done at Dwingeloo. On 2018-10-08 08:21 UTC the image taken at 08:21 UTC was transmitted twice to get all the image chunks. Then the image taken around 08:45 UTC was transmitted at 09:20 UTC, but not all the chunks were received. The 2018-10-08 09:31 UTC recording only contains small chunks missing from previous images. The first chunk of the 2018-10-07 11:10 UTC image and a couple of chunks missing from the 2018-10-08 08:45 UTC. I have also replaced the images above by images I have obtained directly from the Dwingeloo recordings. On 2018-10-09 at 05:25 UTC the UHF radio was activated again and another image was taken automatically. This was the best time to take an image of the Moon and Earth according to the calculations I did in this post. Unfortunately, it was not possible to download the image at that time since the Moon was not visible from Dwingeloo. The image was downloaded the next day, during a scheduled activation of the UHF transmitter on 2018-10-10 at 14:00 UTC. A partial image was published by Cees Bassa at 14:48 UTC and the missing chunks were downloaded later during the same activation. The complete image was published on Twitter at 15:15 UTC together with a colour-corrected version made by Wei, which is shown below. A large portion of this image was also received independently by Robert Mattaliano N6RFM in the United States using a modest station with a single long yagi. Also, during these days, an image showing only a lens flare (or perhaps Earth terribly over-exposed) appeared in the DSLWP-B camera webpage. I do not know when this image was taken or downloaded. I would be grateful if anyone can provide some info about this image. Update 15:20 UTC: Cees Bassa explains that the image below was the first image downloaded in the activation of the UHF transmitter on 2018-10-10 at 14:00 UTC. 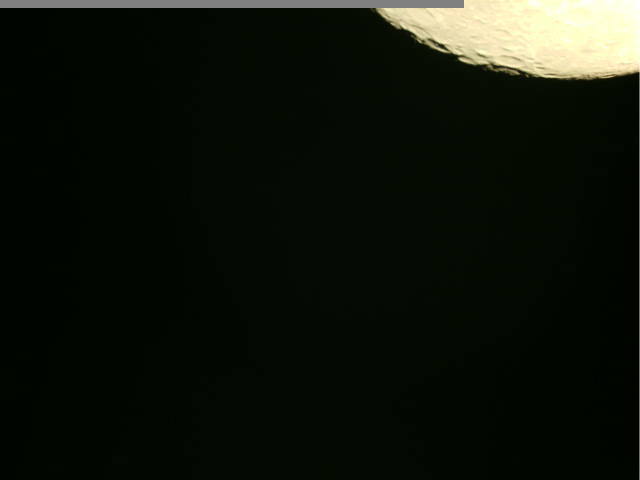 After downloading this image, Reinhard sent commands to transmit the image of the Moon and Earth taken at 2018-10-09 05:25 UTC. 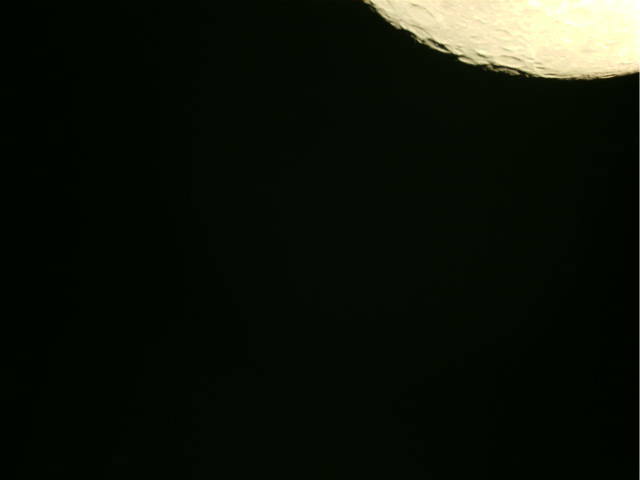 Cees does not know when the image below was taken, but he suspects that perhaps it was taken when the camera was activated at 2018-10-08 13:00 UTC. In this case, the bright spot could be the Earth (note that it occupies a similar area as the Earth in the other images). The image of the Earth and Moon taken on October 9 is really impressive given the technology used to take it. Modifications of this image identifying the visible lunar craters have been shared. The event has been covered in the media with an article by Andrew Jones in gbtimes and some reports in Chinese media. Update: also in the New Scientist. Update 16:30 UTC: Unfortunately, the 2018-10-10 recordings done at Dwingeloo show clock problems in the receiver. There are a lot frequency jumps which cause a lot of packet losses. The images I have decoded from these recordings at Dwingeloo are shown below. We see that the help from other stations was essential in obtaining complete images. I made a recorded animated gif from your upcoming observation analysis, and I sent it to your personal mailbox at destevez.net. It seems, with an animated gif editor it is a good tool to search the time, when the pictures were taken, and havenot time stamps. I made some exports of separeted gif files at 8.th of oct 8:07, 8:35, 8:51 UTC. We can choose, what is the most similar to the real picture.